The majestic Kings Canyon between Uluru and Alice Springs in the red centre of Australia. Anita Kelman camps out under the stars at Kings Creek Station and hikes Kings Canyon’s rim. Gazing down from a plane high above Central Australia, all appears orange-bronze and desert flat. But once on the ground, the landscape evolves to become vividly varied. Many gather at Uluru and her neighbour Kata Tjuta. However my journey is to another geological gem of the Northern Territory. 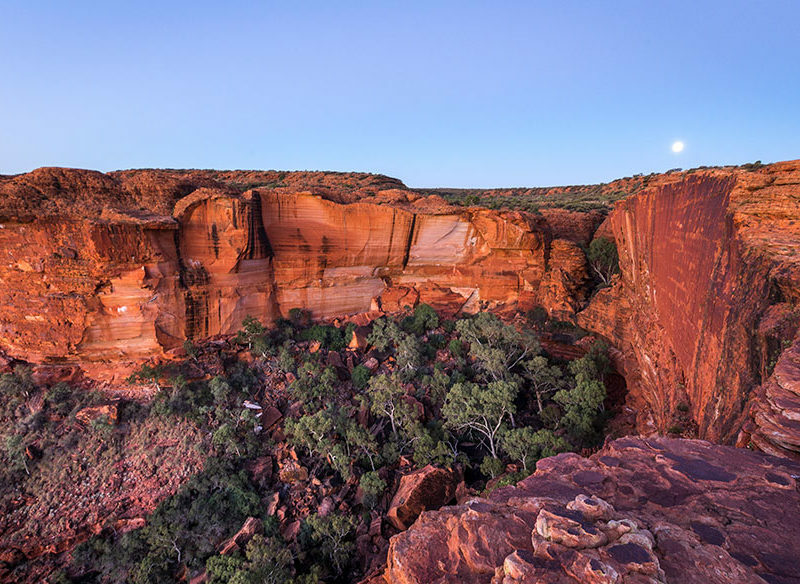 Situated approximately 350 kilometres south-west of Alice Springs is Watarrka National Park, home to Kings Canyon. Arriving just before dusk by 4WD, our outback campsite at Kings Creek Station is dusty and swarming with busy Herculean ants. Unperturbed, the manager directs the group towards a fenced section in the opposition direction. With late November evening temperatures mild at 18 °C, we linger around the camp fire before laying our swags out to rest beneath the scattered ghost gum trees. Sleeping outdoors exposed to nature is a humbling and ethereal experience. The night sky opens and stars slowly begin to emerge, growing brighter until the entire expanse is filled with silvery celestial bodies dancing amongst the darkness. I pause to ponder the vastness of the galaxies high above and smallness of humanity before drifting into peaceful slumber. Rising early to avoid the heat, Kings Canyon awaits. 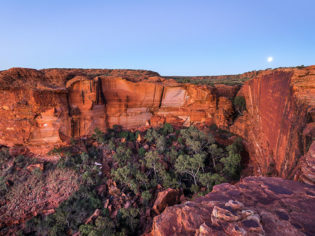 Our challenge is the Canyon Rim Walk, a six kilometre hike touted for its hidden treasures in the form of a sandstone domed lost city, a contoured rock amphitheatre and a swimming hole in the mythically titled Garden of Eden. The initial ascent up uneven steps to the crest of the canyon ridge prompts the heart to pump quicker. Forced deep breaths fill the lungs with crisp air while a gentle easterly breeze cools the sweating brow. My recently filled water bottle is quickly drained to half. Following the path, I traverse along rocky terrain through corridors hedged by petrified formations. The sediment and ancient fossils have intertwined forming distinctive wavy layers. The plateau provides an opportunity for admiring the spectacular landscape far below. Careful not to stray too close to the edge, I eagerly look out over the valley. The views are certainly impressive and one must pause to envision the ancestors of old taking shelter in the small caves and overhangs. Tawny trees congregate along the basin floor, their roots sucking nutrients from the mineral-rich soil and shallow mountain streams. After two hours of discovery, a detour leads down into the heart of the canyon. A lush oasis is awaiting, complete with green foliage, singing birds and a secluded pool glistening in the mid-morning sun. I slip off my hiking boot, touching the surface with my foot. It is cold but not unbearable. Nearby my fellow explorers seem content to remain spectators. Not wishing to waste an opportunity for refreshment but nervous imagining what animals may reside beneath, I plunge into the semi-murky water. My retreat back onto land is instantaneous. Something definitely brushed against my leg! Prostrating upon the heated rock ledge, I absorb the sun’s energy. A curious bee, perhaps attracted by my pale skin, lands and in fright releases its sting into my exposed belly. I feel sad not only for the throbbing pain beneath my flesh but for inadvertently causing the demise of this small creature of the canyon. Time is up and the group maneuvers back onto the main trail. The canyon slopes gently down past more rocky structures towards the car-park and an awaiting picnic. Before my Central Australian holiday I had never heard of Wattarrka National Park. But having visited and experienced the magic of Kings Canyon, it is now my favourite location in the Australian outback. The breathtaking sandstone chasm plunging 270m is one of Australia’s most dramatically beautiful places – a slash of deep green in a red landscape. Hidden deep in Watarrka National Park three hours north of Uluru, Kings Canyon offers two trails: the Creek Walk and the Canyon Walk. The 1.5km Creek Walk is quite flat, up the centre of the canyon to a lookout point. The Canyon Walk, however, is for the committed walker only, as the first 300-400m are straight up a steep incline at the canyon edge. It’s hugely rewarding, though, with delights all the way round, including the Garden of Eden valley and the Lost City’s weathered rocks. Did you know? The original custodians of the park are the Luritja people, and they’re still represented among the three Aboriginal groups that live in the park. The name Watarrka comes from the Luritja name for Umbrella Bush. How to get there: Kings Canyon is located in the Watarrka National Park, 323km southwest of Alice Springs. There are several stopovers on the way to the Canyon, including Jim’s Place on the Stuart Highway, as well as Erldunda and Mt Ebenezer. Best time to go: Anytime, but beware that it is very hot during the summer months. Where is it? Luritja Road, just outside the Watarrka National Park. From Uluru it is 300km; from Alice Springs it is 300km on dirt roads or 450km on sealed roads. Access by 2WD or 4WD (check conditions) or by light aircraft, airstrip on property. Open: year-round. What makes it so special? Covering 1800 square kilometres, Kings Creek Station was established in 1982 as a cattle and camel property by Ian Conway and his wife Lyn. You can visit the Stockcamp to watch live camel and horse handling, eat damper and drink billy tea, go on camel rides and quad-bike safaris to explore the red sand dunes, mulga scrub and golden fields of spinifex. There are also scenic helicopter flights over Kings Canyon and the West MacDonnell Ranges. For an extra fee they’ll set you up at a remote camp for a romantic dinner and night under the stars in swags. Accommodation options: Unpowered and powered campsites as well as safari-style canvas-sided cabins with power and shared facilities .